Let's understand SOA by below diagram. 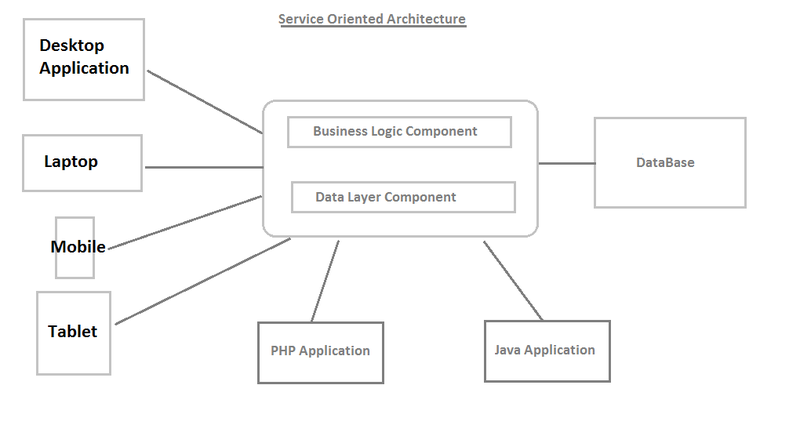 In the above picture, you can see that Business Logic and Data Layer are hosted on some other server which is communicating with Database. Now any type of application whether it is ASP.Net, Java or PHP can communicate with a hosted service. Only UI need to develop for all device/platform and no Business Logic and Data Layer code require at the client side. For example, Apple (IOS) application wants to utilize an application X and the Business Logic and Data Layer of that application is hosted on some server. In this case, the IOS developer needs to work on the UI layer only. So, you can say that SOA is an architectural style to design a distributed system.